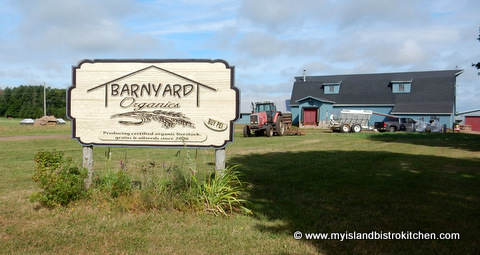 I recently paid a visit to the Bernard family at Barnyard Organics in Freetown, PEI. Sally and Mark Bernard operate one of the largest (if not the biggest) organic farms on the Island and Sally and her daughter, Lucy, were my tour guides. Sally (who grew up on a farm in New Brunswick) and Mark (from an Island farming family) met at the Nova Scotia Agricultural College (NSAC) in Truro, Nova Scotia. Sally has an English degree from Mount Alison as well as a Plant Science Diploma from NSAC while Mark holds an Agricultural Business Diploma with a minor in Plant Science. In 2003, while still in college, Mark knew he wanted to pursue organic farming. His father had recently retired from farming so Mark began the groundwork for preparing the first 50 acres on his family’s farm to be taken out of conventional farming practices. The Bernards officially became certified organic farmers in 2006 and, since 2010, they have 550 organic acres on their farm and also rent additional acreage near Kensington. 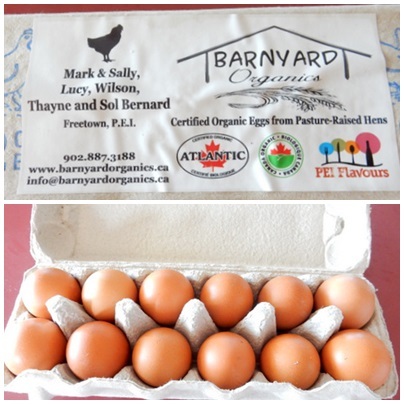 Barnyard Organics, the name of the farm, is certified under Atlantic Certified Organics (ACO), a certification body which is accredited with the Canadian federal government. This body enforces the national organic standards such as buffer zone requirements from surrounding farms using conventional farming methods and it provides a list of approved substances that can be used in organic farming. As such, the farm is required to keep records of any products or substances used. In order to remain certified organic, the Bernards are subject to yearly inspections from ACO. The main focus of the farm is on growing grains that include soybean, barley, wheat, oats, field peas, buckwheat, and clover. More than half of the grains are sold to small-scale organic producers in the Maritimes as a complete mixed animal feed. The remaining half goes to Speerville Flour Mill in New Brunswick and to brokers in Quebec and Ontario. Of note, 35-40 acres of the farm are dedicated to growing wheat specifically for bread. 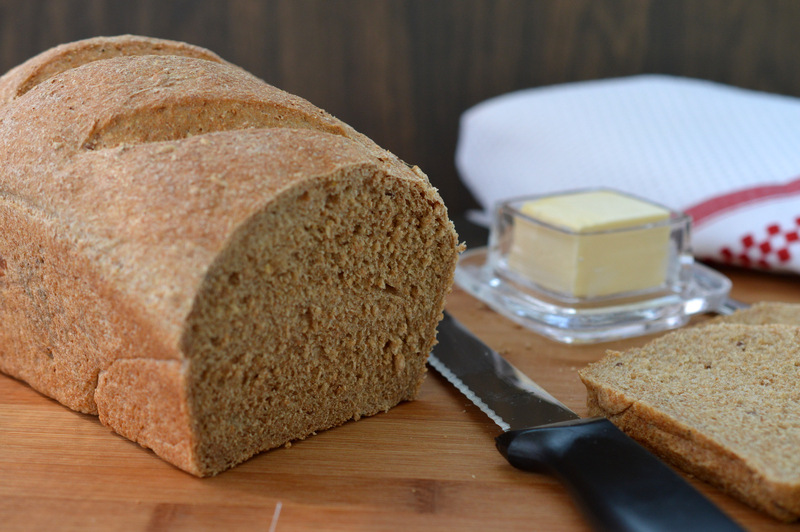 In fact, a nearby neighbour, Coral Wood, uses wheat from Barnyard Organics in her Whole Grain Bakery. 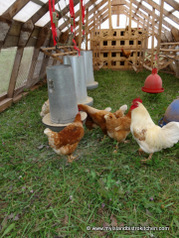 In addition, the Bernards also have both meat birds and about 150 laying hens. 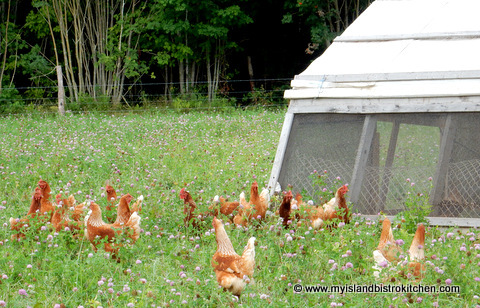 The meat birds are raised on a portable pasture system which means the shelters they live in are moved each day so the birds always have fresh grass to nibble on. 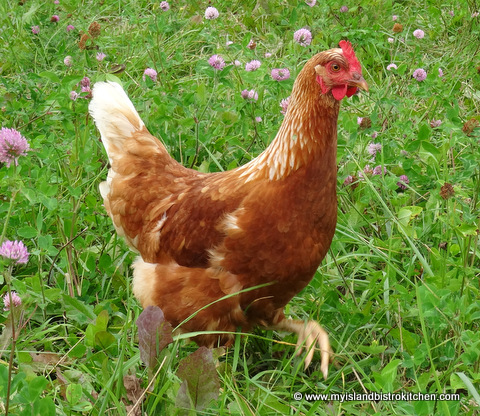 The laying hens are completely free range so they have unfettered roaming privileges in a field nearest the farm buildings. They then take up winter residence inside a barn. These are their summer condos! This is where the flock hangs out when they are not out roaming about the field. And, this is what is found on the other side of the “condos”. 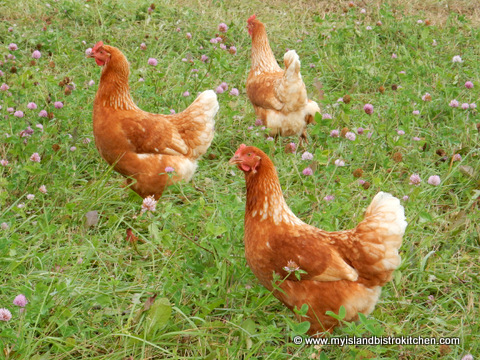 Both meat and laying birds are raised on organic grains grown on the farm so the Bernards know exactly what their fowl are fed and customers can be assured the chickens and eggs are organic and of the highest quality. About 90% of their meat birds and eggs are direct marketed to customers through CSA (Community Supported Agriculture) shares. This is a program whereby consumers (sometimes referred to as shareholders) invest in their food system by paying, the producer, upfront, for a season of fresh farm products. In exchange, the producer agrees to employ good farming practices to ensure a food supply and commits to sharing the resulting farm produce with those shareholders. 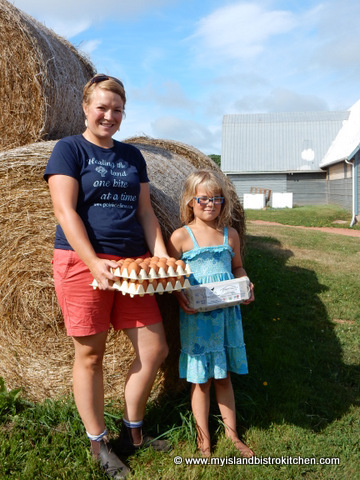 This method of farming gives the farmer operating capital to buy supplies and run the farm and, in turn, CSA customers get quality fresh produce – in this case, fresh organic chickens and eggs from the Bernards. Barnyard Organics currently has 100 CSA members and delivers to customers every two weeks in both Charlottetown and Summerside, alternating week about. Sally packages her fresh chickens and eggs, loads up her trolley fitted with refrigeration, and heads off with her deliveries. Through the CSA market method, Sally gets to know her customers directly and they get to meet with the producer of their food and have the opportunity to put money directly into the producer’s hands with no middle parties. In addition, this customer-producer interaction provides the opportunity for customers to know where their food comes from and learn how it is produced. For the producer, this method allows for face-to-face feedback on products. 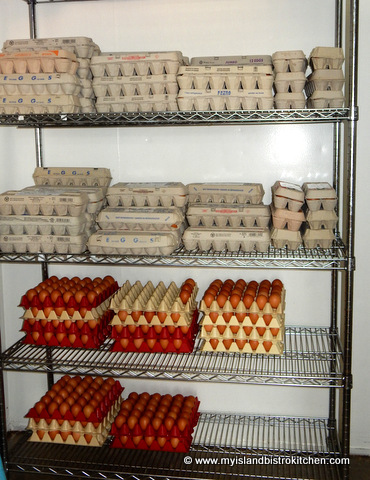 The remaining 10% of the farm’s products are sold to customers who regularly drop by the farm to pick up their farm-fresh eggs and chickens from the large cooler the family installed on the farm. 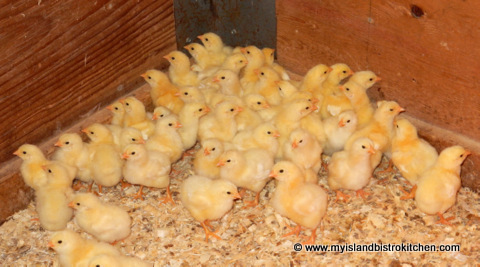 Barnyard Organics also has a small provincially-inspected processing plant where they process approximately 60 chickens a week, ready for distribution to their customers. Farming organically is not without its challenges. For example, the Bernards don’t use chemical treatments that conventional farmers do so they can’t buy just any kind of fertilizer for their fields. Instead, they use mussel shell waste as well as manure from a nearby dairy farm; however, the manure needs to first be composted before being spread on the fields because it is not organic. 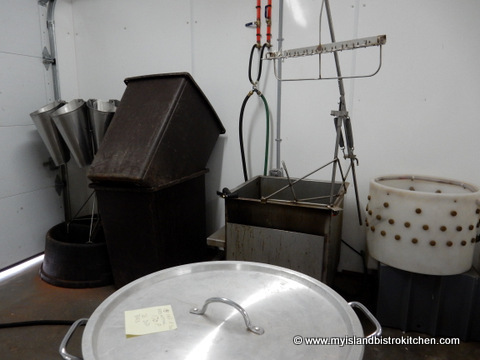 The farm also has its own grain dryer and soybean roaster which are needed because the Bernards can’t take their product to any local commercial dryers or roasters because of potential cross-contamination with non-organic grains. Sally says their greatest satisfaction comes from knowing they have healthy soil on their farm to produce healthy food. The Bernards practice healthy crop rotation and focus on feeding the soil, not taking from it and depleting its goodness. In particular, Sally derives great satisfaction from seeing their children interact with farm life. Because she home schools the children, they are exposed each and every day to experiential learning on the farm. Even 7-year old Lucy is already involved with organic farming. She takes the livers and hearts of the processed chickens, dehydrates them, and sells them for organic dog food. 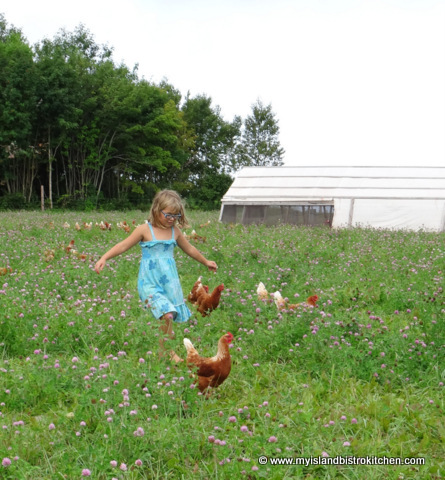 Lucy is also helping with the chicken business on the farm, too, and happily moves about the field of hens. Sally jokes that Lucy could give the tour of the farm as well as she can and says their children are so acclimatized to farm life that they don’t even know that not everyone knows what life on a farm is like. 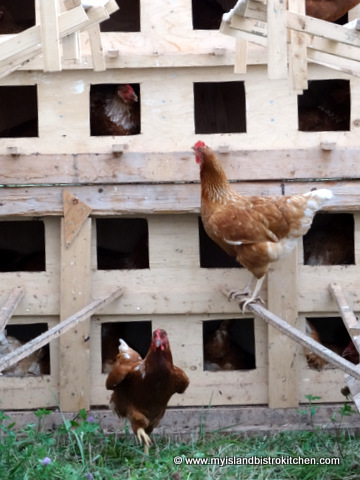 This summer Sally started a “Rent-A-Chicken” project that was so popular, she ended up with a waiting list. 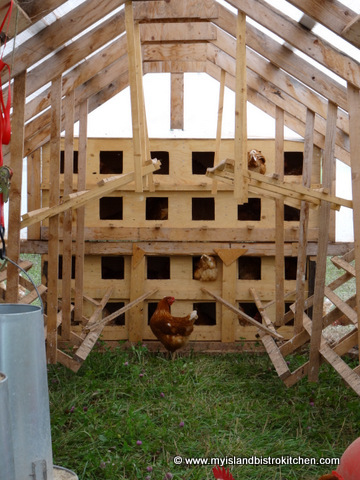 Essentially, the initiative allowed people to have a couple of chickens in their own backyards from June until October, enjoy the eggs, and then return the chickens to the Bernards in the fall without having to worry about what to do with the birds in the winter. 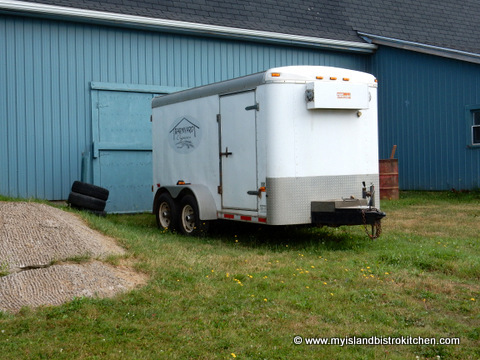 The Bernards delivered, to renters, a small, portable chicken coop, two laying hens, feed and grit, food and water dishes, and a guide for raising hens. 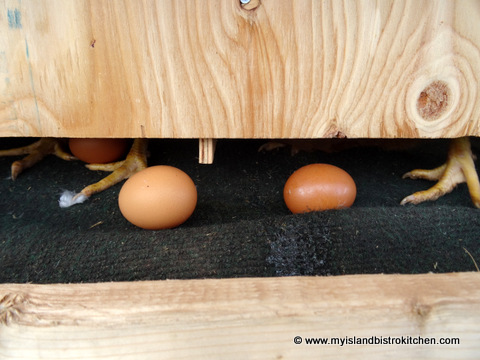 Ideally, each hen could be expected to lay six eggs a week so renters have a dozen fresh organic eggs every week. In the fall, the Bernards will pick up the birds and take them back to the farm. Cost for the package for the 2015 season was around $300. Feedback has been very positive and, in fact, some folks have already asked that the birds be banded so they can have the same ones back next year! 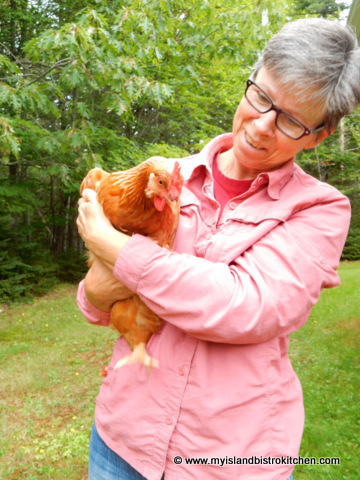 To find out, from a renter’s perspective, what the chicken rental experience was like, I met with Shirley Gallant who had two birds rented from the Bernards this summer. As soon as she heard of the opportunity, Shirley knew it was for her as she had had a few hens in her backyard some years ago but wintering them was a problem for her. 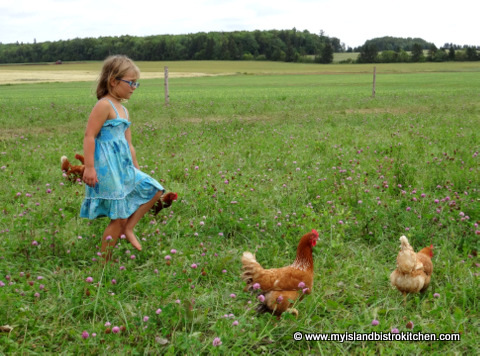 Because the Bernards will collect the two hens in the fall, Shirley has been able to have the hens for the summer and enjoy their eggs with no worries about what to do with the hens over the winter. 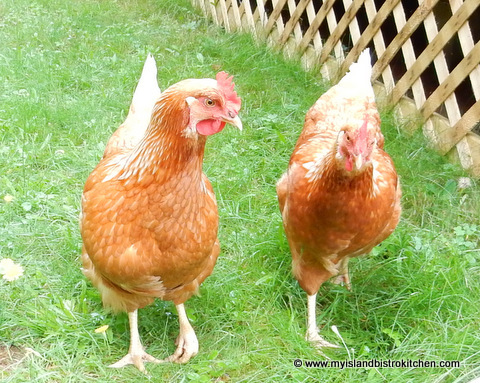 The two hens happily roam around Shirley’s yard during the day and then retire to their coop for the night. For Shirley, the experience has been very positive and she says she would do it again because “the hens are fun to have around” and she has fresh eggs for her organic diet. Barnyard Organics farm does offer tours but the Bernards appreciate advance reservations as this is a busy working farm and family. For more information on Barnyard Organics, visit their website. As is my standard practice when I visit a local food producer, I like to create a recipe using and featuring one of their products. 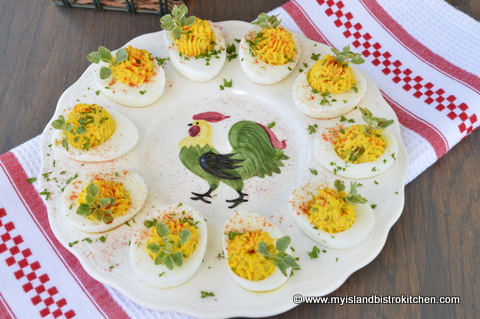 I have chosen to use the brown eggs to make devilled eggs. 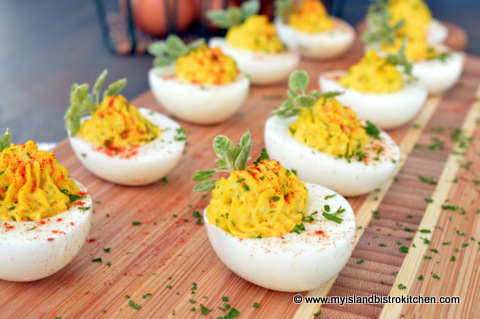 These eggs have gorgeous vibrant yellow yolks so they make colorful devilled eggs. 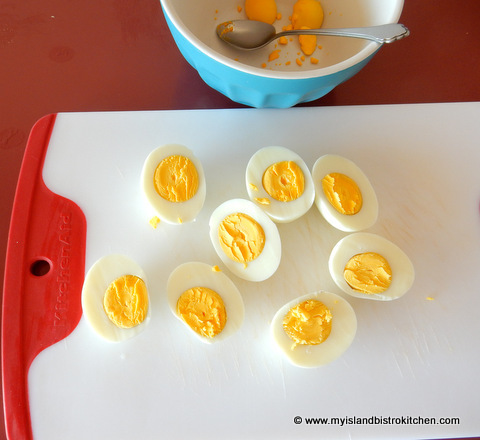 Gently scoop out egg yolks and place in small bowl. Set egg whites aside. Mash egg yolks with fork. Add all remaining ingredients. Mix well. 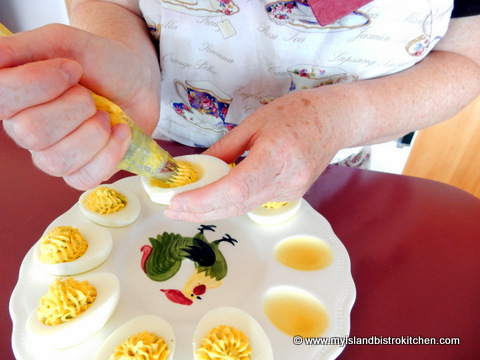 Fill egg white cavities with the devilled egg mixture using either a pastry bag fitted with a large decorative tip (I use a Wilton 6B tip) or, alternatively, use a spoon. 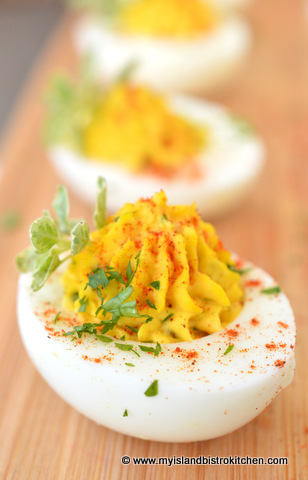 Refrigerate devilled eggs at least 1 hour before serving. At time of serving, sprinkle with chopped fresh parsley and/or paprika. Garnish each with a small sprig of a fresh herb, if desired.